Default Windows network settings for Windows 7 and 8 are not optimized for today’s fast internet traffic and VPN speeds. 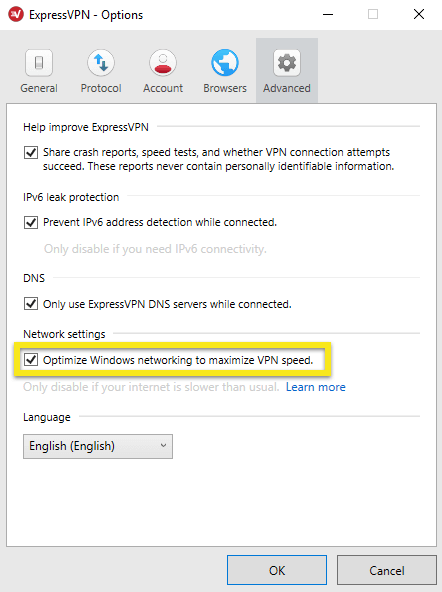 When the Optimize Windows networking to maximize VPN speed box is checked, that means the ExpressVPN app has applied the latest recommended settings from Microsoft. However, if you’re noticing particularly slow speeds or general network issues, you can restore the default Windows network settings by clicking on the hamburger menu (≡) > Options > Advanced > Network settings > unchecking the box.